About Muskoka Timber Frame Co. 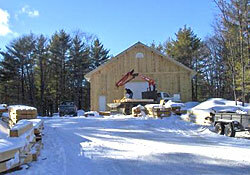 The Muskoka Timber Frame Co. was established in 1999. Ron Downing is not only the owner of the company, but a hands on carpenter involved directly with the construction of every timber framed structure we create. Ron has been building with wood for over 25 years, in fact right out of college, he started his own fence and deck business. Over the years to come, he became involved in complete home and cottage construction. After helping construct a timber frame home in 1995 he decided to start up his company called Ronald G. Downing Construction. The revival of timber framing is growing stronger every year and as he began to build more and more with timbers, the Muskoka Timber Frame Company was created 4 years later. Whether you would like a structural timber frame home or cosmetic accent timbers, you will experience the best quality, workmanship and service in the industry. In the early years of Timber Framing, the craftsmen cut & shaped the timbers by hand with hand tools. This ancient craft was passed on from generation to generation. There is still timber frame structures standing today that date back hundreds of years. It is believed the craft originated from the earliest ship builders over a thousand years ago. The industrial revolution caused the decline of timber frame construction as a common form of building. The craft was not being passed on while the craftsmen were passing on. Many of the craftsmen from the past few decades that were passionate about Timber Framing were students without teachers and have learned their craft from examining old structures and limited literature from the past. These men and women, along with the Timber Framers Guild of North America have been responsible for the revival of the timber frame. 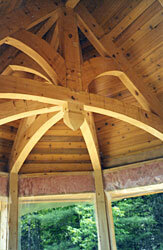 We do our part to continue to produce a product worthy of the true TIMBER FRAME. Our frames are hand crafted in our shop in Bracebridge and shipped to the site for erection by our timber framers or your carpenters. The three species of timber we use are Hemlock, Douglas Fir and White Pine, the latter being the most popular. The finish of the timber can be dressed, rough sawn or hand hewn. Our joinery is done in the traditional way of the old world craftsman.